Time to 'Try' a Woman in White House, Clinton Says Will she or won't she? 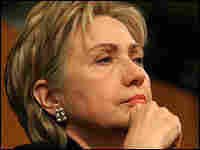 Sen. Hillary Rodham Clinton hasn't definitely said whether she will run for president in 2008. But in an NPR interview, she says that the time is right for a woman to try. Sen. Hillary Rodham Clinton isn't saying whether she's looking to return to the White House. Will she or won't she? 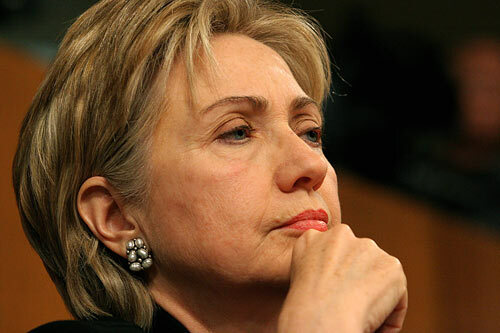 Hillary Clinton hasn't definitely said whether she will run for president in 2008. But in an NPR interview, she says that the time is right for a woman to try. "I don't know whether we're ready or not" for voters to elect a woman president, the Democratic senator from New York tells Steve Inskeep. "But I think at some point we need to try. Other countries have beaten us to the punch. And I don't think there's any place in the world where it's better to be a woman, with more choices and opportunities, than in 21st-century America." The former first lady is giving a handful of interviews to promote a new edition of It Takes a Village, her 1996 volume about the community's role in raising kids. While she was writing it a decade ago, her party had recently lost control of Congress. Democrats lost at least in part because of the disastrous effort at national health care that Mrs. Clinton supervised. Ten years later, her party has just won back Congress. And the nation is at war. But she still endorses her book's call for universal health care. While she agrees that national security should be a top priority, Clinton says the war in Iraq has drained resources from other pressing problems, including health care and education. "Security is the No. 1 problem we face, and that's as it should be because we were attacked and we have people around the world, unfortunately, plotting against us as we speak," she says. "Unfortunately, we have only focused, and I believe in an inadequate way, on one of our problems in the last six years." Clinton predicts that Democrats will push initiatives on universal health care, greater energy independence, global climate change and education when they take control of Congress. "I believe America can confront any problem if we're willing to make some tough decisions," she says. "We've not been asked to make any tough decisions. The president hasn't called for sacrifice from any of us. We're not asked to even turn the lights off and conserve energy in order to limit the amount of money that is flowing to regimes that are antithetical to our interests." She says balancing the federal budget must be another priority. "That means we're going to have to cut spending, and we're going to take a hard look at these tax cuts that have not produced the revenues that were promised when the Bush administration laid it out." Does that mean raising taxes? "I'm not sure you need to raise them," Clinton says. "I think you need to prevent them from continuing to be cut, and you also need to take a hard look at the ones that are about to expire. Everybody's got to pitch in." "I'd like to make sure the record is clear and then people can make their own judgments."